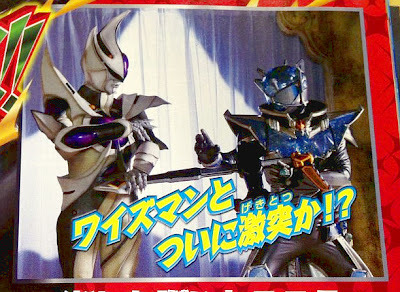 A new image from the recent Japanese magazine issue shows Kamen Rider Wizard Infinity fighting against the leader of the Phantoms, Wiseman. So far, nothing is known regarding this at this point. 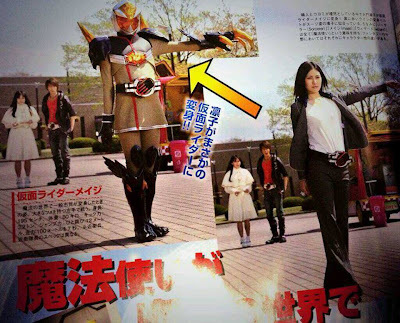 But one thing is sure, this will happen next month in Kamen Rider Wizard. 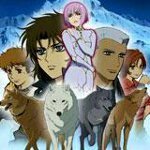 Would we see now how Wiseman fights? How about the Philosopher's Stone mention by Gremlin? Stay tuned for additional information in the coming days. Also ich hab heute leider erst mich zu Wizard verlaufen und bin sehr Begeistert (Mantel!). Weiß man schon wie lange der noch läuft bzw. ist schon was neues Angekündigt? Was genaues is noch nich bekannt aber länger als 50 Episoden dürfte es nich werden. Jede Kamen Rider Serie ist gut zum anfangen. Du hast hier ja keine wirkliche Historie wie zum beispiel bei Amerikanischen Superhelden. Es wird halt alles immer auf null gesetzt und in Crossovern wird dann mal aufgegriffen das es noch andre Rider gibt. Is zwar n bisschen Off-Topic aber welcher Rider ist eigentlich so der Geilste bzw. Stärkste? Ich mag ja eher etwas Düstere Storys, weshalb mir OOO zb. nicht so gut gefallen hat. Wenn du wirklich düstere Storys suchst dann sind Black,Kuuga und Agito die besten die du dir anschauen kannst die auch komplett zu bekommen sind. More scans for the events that will happen in Kamen Rider Wizard this May has surfaced online. 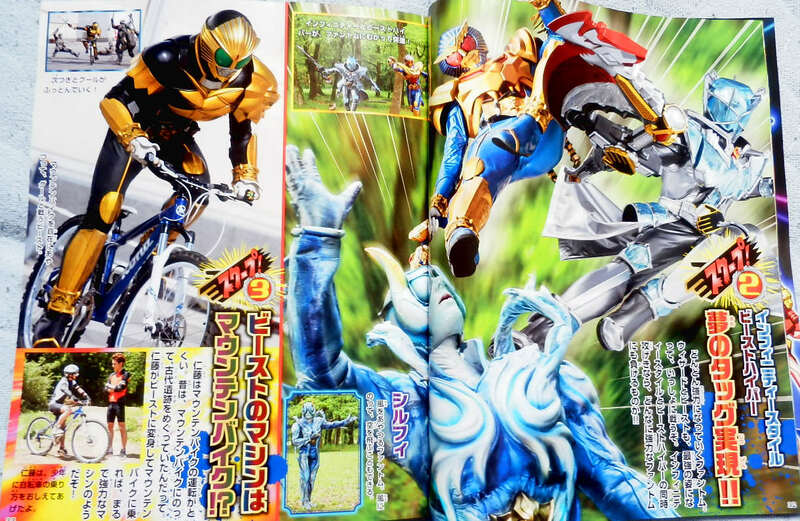 These scans has something to do with Wizard vs. Wiseman. In this scan above, Wizard Infinity used his older Rings such as Bind and Defend in his fight against Wiseman. 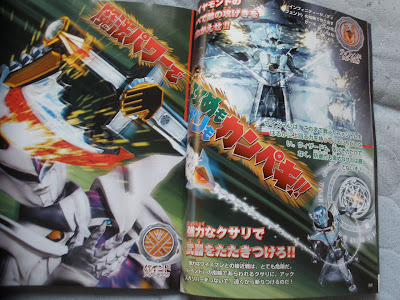 As seen in this scan, with the use of the Bind Ring, he can swing the AxCalibur around. With the use of the Defend Ring, he can create the strongest barrier that can withstand any attack! 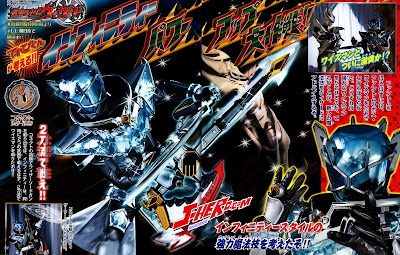 Based on the recent Kamen Rider Wizard toy catalog, the White Wizard will play a major role the series this May. The scan only shows him using his Explosion and Teleport Rings. Also seen are some of the major events in the previous episodes that he is part of. Kamen Rider Wizard HBV Update: More Wizard & Beast Costumes! 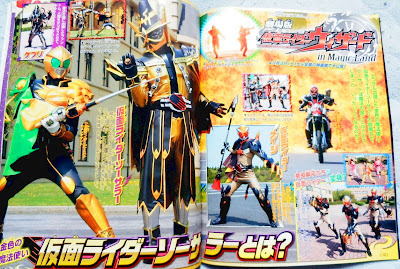 Aside from dancing and Wizard and Beast switching their powers, a recent scan for the upcoming Kamen Rider Wizard Hyper Battle DVD entitled, "Kamen Rider Wizard Hyper Battle DVD: Showtime with the Dance Ring" will feature our heroes wearing costumes based on Beast's Mantles! 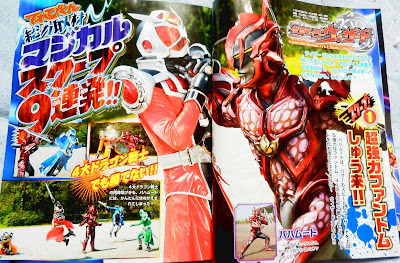 Seen in the scan above, Kousuke is now a falcon while Haruto is now a buffalo! 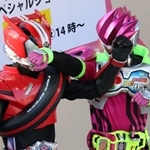 In the Hyper Battle DVD, Haruto and Kosuke go into the Donut Shop Manager's Underworld and use the powers of the Dance Ring. The Kamen Rider Wizard Hyper Battle DVD costs 1,300 yen and will be released this May. Die Infinity Style Debüt Folge hat mir gut gefallen und endlich gab es wieder etwas, was meine Vermutung näher bringt, dass White Wizard und der Wiseman zusammen arbeiten oder ein und dieselbe Person sind. Nämlich nach der Verwandlung von Haruto, sagte White Wizard: „This has become a problem". 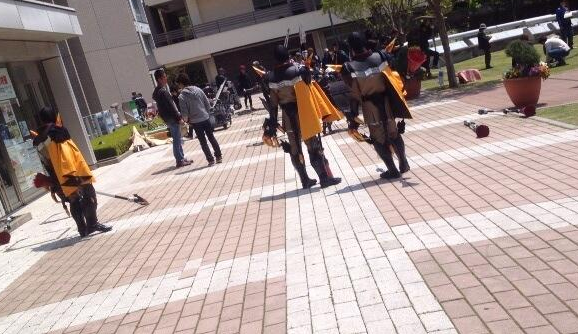 A filming for the upcoming Kamen Rider Wizard The Movie was spotted at Ryutsu Keizai University, in the city of Ibaraki. Photos of the set surfaced in the internet, showing a preview on what we could expect in the film this August. According to the people who saw the filming, there were about 4-5 people with a similar face to Wizard, but the body was different. 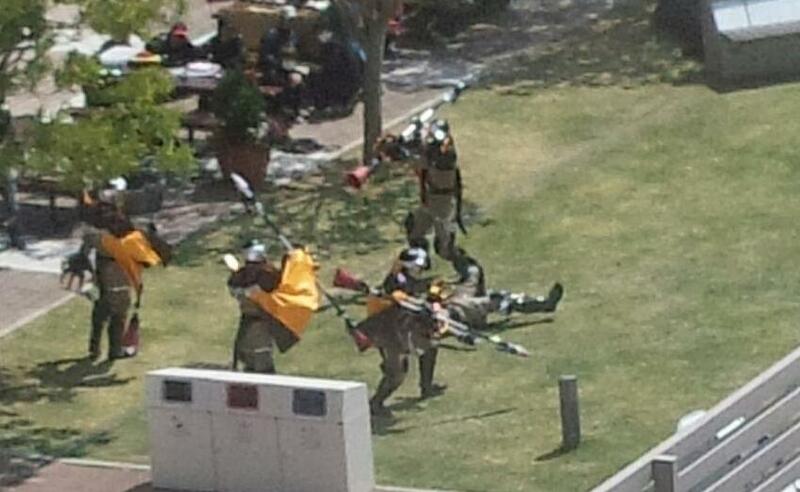 For a certain scene, they were attacking Kamen Rider Beast. Rumor has it that everyone will become magicians. 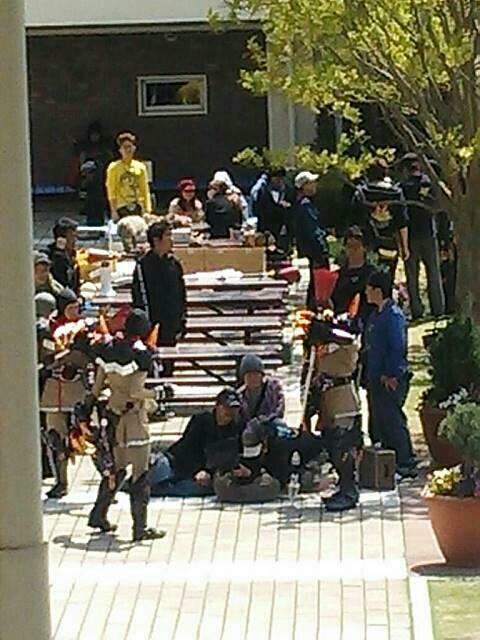 Last month, a filming was seen at Chiba's Kanda University where the donut guys are wearing WizarDrivers and rings. Kamen Rider Wizard The Movie will be directed by Shojiro Nakazawa and written by Junko Komura. Haruto will be traveling to the "Land of Magic" where he will meet the Golden Magician. The film premieres August 3rd. 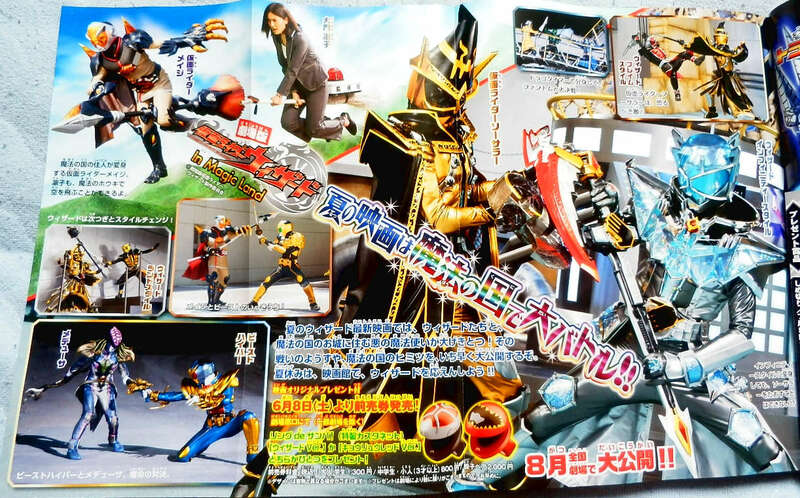 Yesterday, the first image of the Golden Wizard was seen, and now a new photo featuring the DX Super Wizard Battle Ring Set had shown a little bit of additional info for the villain of the upcoming Kamen Rider Wizard The Movie. This shows two new Wizard Rings — Finish Strike Wizard Ring and Final Strike Wizard Ring, one to be used by Kamen Rider Wizard Infinity and one by the Golden Wizard. 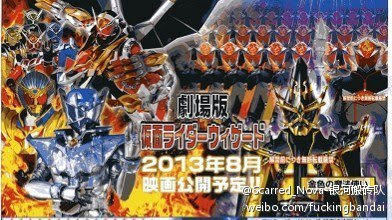 The first image for the upcoming Kamen Rider Wizard The Movie started circulating online. 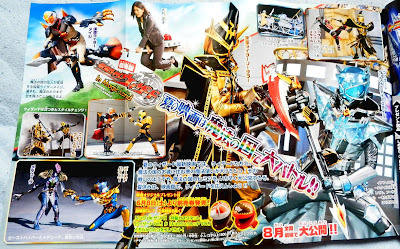 The image is said to come from the new Kamen Rider Wizard toy catalog. 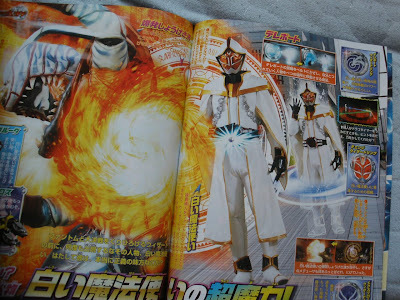 Seen in the image is the Golden Wizard, a powerful magician that Haruto will meet in the "Land of Magic". The combatants at the back looks similar to the ones seen during the movie filming we reported days ago. Kamen Rider Wizard The Movie will be directed by Shojiro Nakazawa and written by Junko Komura. The film premieres August 3rd. Also ich muss sagen das mit Wizard bis jetzt im großen und ganzen Gefällt. Ich mag die Story und auch de Charakter. 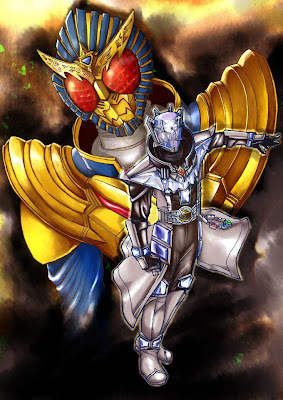 Wizard ist Rider sehr cool und auch seine Formen sind sehr nice. 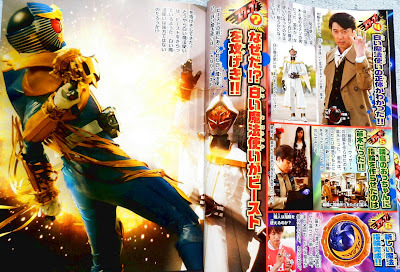 Wizard Movie Rumors: Kamen Rider Mage Appears! Rumors has it that a new Kamen Rider, aside from the previously revealed "Golden Wizard", will be appearing in the upcoming Kamen Rider Wizard The Movie. He said to be called Kamen Rider Mage. In the film, anyone can be a magician, where the magical rings can be bought at the antique shop. Wajima is said to transform into Kamen Rider Mage in order to demonstrate how a certain spell works. 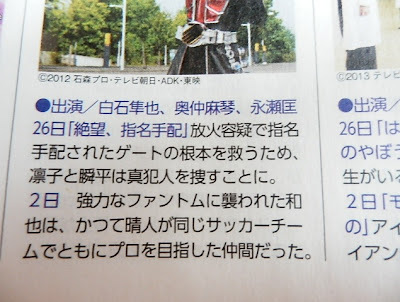 After months of waiting, an upcoming episode of Kamen Rider Wizard will reveal more of Haruto's past! 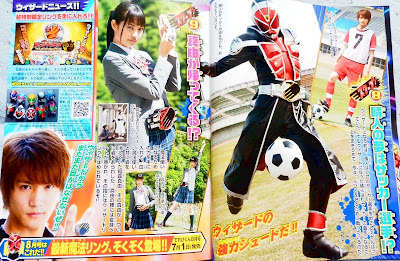 According to DecaEnd of HJU, Haruto was once a pro soccer player. It is likely this episode will air next month. Additionally, Medusa Phantom’s twin sister, Mayu will return after learning magic from the White Wizard. 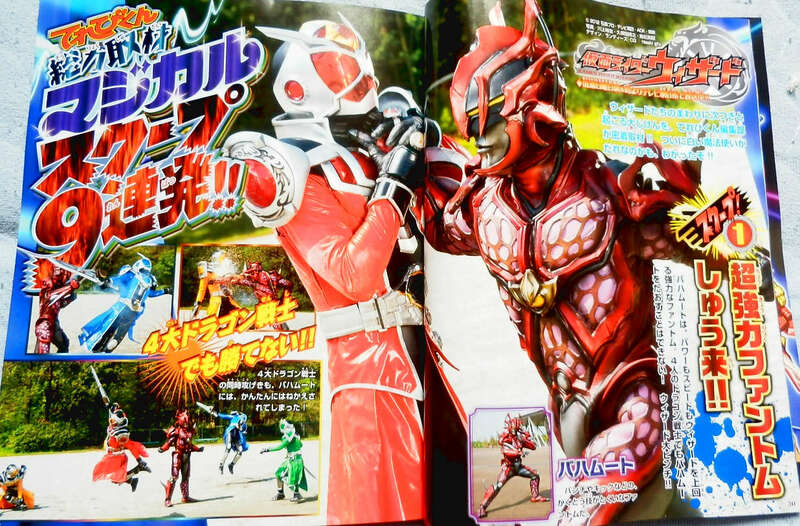 Images from the latest issues of Japanese magazines had showed up some preview shots from the upcoming Kamen Rider Wizard film, “Kamen Rider Wizard In Magic Land”. Additionally, we came to see the real identity of the White Wizard. 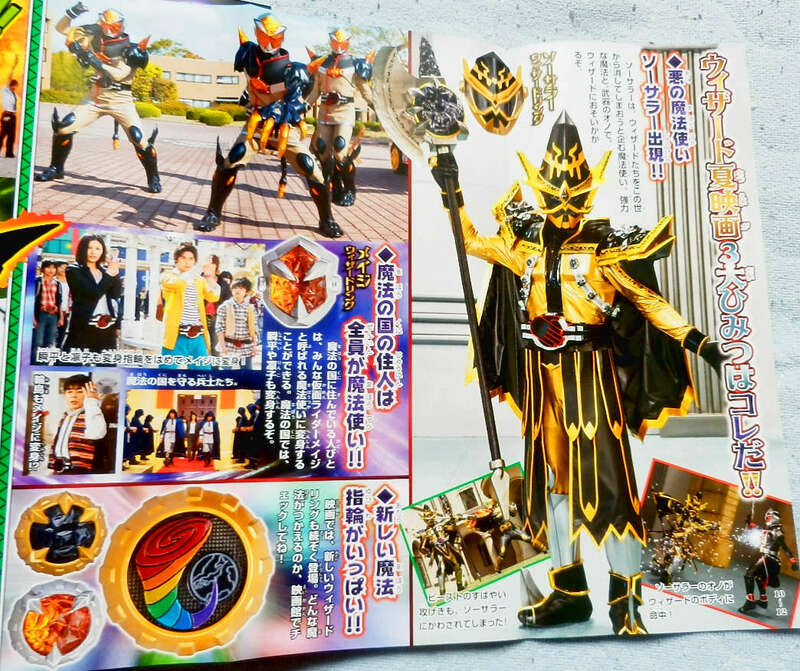 In the film, Haruto will be traveling to the "Land of Magic" where he will meet the Golden Magician, which will now be officially called Kamen Rider Sorcerer. In the said place, anyone can transform into Kamen Rider Mage (using the belt similar to that of the White Wizard's). In the image below, we can see Rinko, Shunpei and Wajima preparing to transform. Also seen above is the Mage Wizard Ring, Sorcerer Wizard Ring, and three additional rings that are yet to be named. To premiere on August 3rd, Kamen Rider Wizard In Magic Land will be directed by Shojiro Nakazawa and written by Junko Komura. On the the Kamen Rider Wizard TV series. 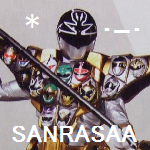 In the next episodes, we can finally see Haruto's back story and the real identity of the White Wizard. From the next week's episode preview, a mysterious man came to see Wajima. White Wizard is the man called Fueki. In the image above, we can see Kamen Rider Beast Hyper taking him on, but to no avail. A new Wizard Ring will also debut in the next arc. Next week's featured Phantom, Bahamut. Although it resembles a dragon in various Japanese media, it is based on a vast fish that supports the earth in Arabian mythology. Kamen Rider Wizard is forced to use the DragoTimer against him. Another Phantom to be featured in the show, Sylph. It is based on a mythological creature in the Western tradition that have the element of wind/air. Sylph Phantom takes on Kamen Rider Wizard Infinity and Beast Hyper's double rider kick! 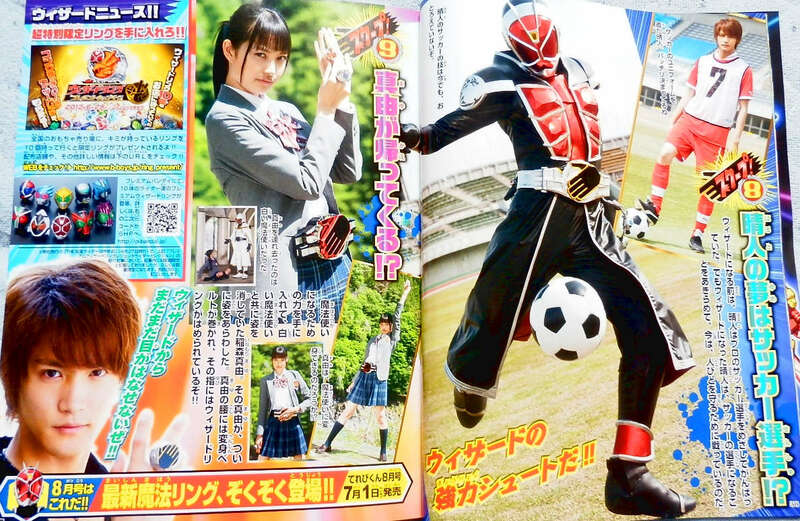 And lastly, Mayu will return in the upcoming episodes after she had finished her training under the White Wizard. Will she be going to be our next female Kamen Rider? 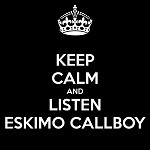 Watch out in the coming weeks! Ich freue mich schon auf Mayu, ich hoffe sie hat einen eigenen Kamen Rider Anzug und nicht sowas wie White Wizard Girl. Und nach dem Bild von White Wzard als Mensch gehe ich stark davon aus, das er und Wiseman ein und die selbe Person sind, da die Silhouette von Wiseman als Mensch hinter dem Vorhang, Fueki ähnlich sieht. DeXter hat geschrieben: Ich freue mich schon auf Mayu, ich hoffe sie hat einen eigenen Kamen Rider Anzug und nicht sowas wie White Wizard Girl. Ich finde der Ring den sie benutzt sieht aus wie der von Kamen Rider Mage aus dem Film. Ich finde es auch sehr Geil das wir wieder einen Weiblichen Rider bekommen. Und der Gold Wizard sieht auch cool aus. It has been revealed that 54 year old Jinnai Takanori (ROCKERS, live action Detective Conan) will be playing the role of Kamen Rider Sorcerer in the upcoming summer film Kamen Rider Wizard In Magic Land. He is currently considered as the oldest actor to become a Kamen Rider. Jinnai will play Prime Minister Orma. According to producer Hideaki Utsunomiya, they wanted someone who could play a very menacing and intimidating ruler. 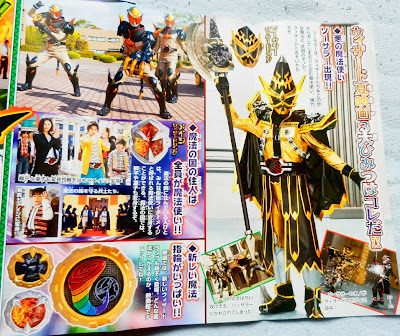 In the film, Haruto will be traveling to the "Land of Magic" where he will meet the Golden Magician, which will now be officially called Kamen Rider Sorcerer. To premiere on August 3rd, Kamen Rider Wizard In Magic Land will be directed by Shojiro Nakazawa and written by Junko Komura. Ich finde der Schauspieler von Kamen Rider Sorcerer sieht echt cool aus. And as seen above is Rinko transforming into Kamen Rider Mage. Also in Magic Land, he meets an orphan named Shiina. Also staring in the movie is Shugo Oshinari (Battle Royale II, Akihabara@Deep) as Emperor Maya, which he meets in his Emerald Palace. 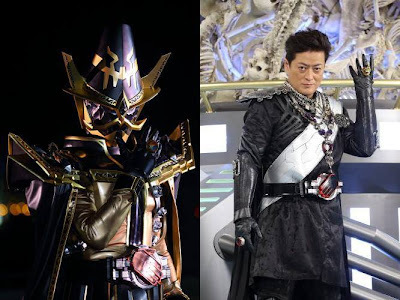 In Oricon's report on Jinnai Takanori's role as Kamen Rider Sorcerer, it also revealed additional details on the plot of the upcoming summer film Kamen Rider Wizard In Magic Land. 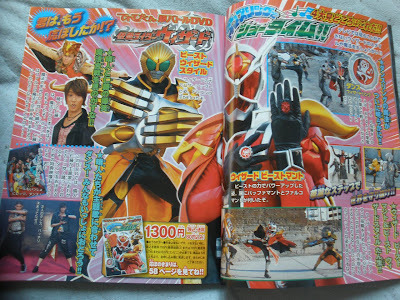 The film will also be the debut of Kamen Rider Mage. A rainbow colored tornado takes Haruto and his friends to "Magic Land", a place where residents never developed science. Instead they put extensive research on magic. In this place, anyone has an ability to use magic, and some of them can even transform into Kamen Rider Mage. When Haruto arrives, he meets a young orphan called Shiina. As Haruto explores Magic Land, he finds the Emerald Palace and meets Emperor Maya (Shugo Oshinari). He will also meet Prime Minister Orma, who is known as Kamen Rider Sorcerer, who plans on recreating the world for magicians only. With Kamen Rider Wizard episodes are currently in its late 30's, I do think many have already noticed the writings on Wizard and company's Magic Circles. But did you those that those writings have a meaning? -Outer circle: Emerged from the magical stones. Representing the great power in this world. -Inner circle: Please release the power of devilish hidden in ring. -Flame: Please set the power of fire free. -Land: Please set the power of ground free. -Water: Please set the power of water free. -Hurricane: Please set the power of wind free. -Outer circle: I order to all the spirits. Release the large power based on the contract with me. -Inner circle: My kin, great power. Gland. Sea. Sky. Natural. Fourfield chief. -Outer circle: Enforcer of chaos. Please dedicate power of the without shape. Realive people in this world of the old contract. -Inner circle: Force responsible for all things. It with or will. Check out kamen-rider-accel.tumblr.com for an in-depth look at this topic.